The United States of America is the world's most powerful, influential nation on the planet. That is a fact. Our military might and diplomatic clout has placed us ahead of every other nation. Our allies depend on us to apply sound judgement and policies to ensure global stability. The world's adversaries seek to undermine the peace we seek to maintain, what alliances we cherish and the positive strides we seek to make around the world. I believe the United States has to get back to basics when it comes to foreign policy and national security. 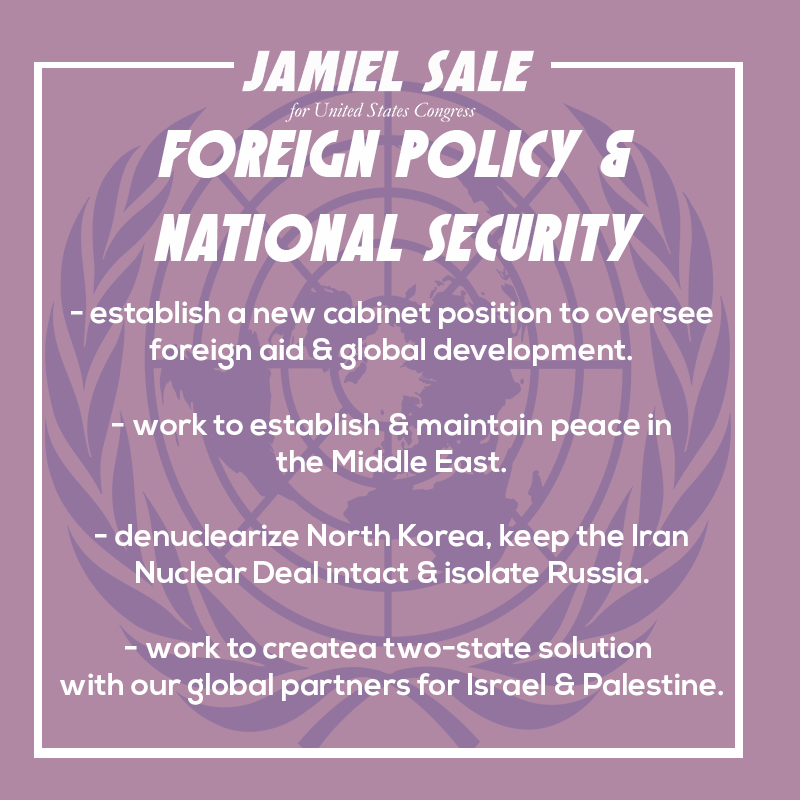 Other than the President, the Secretary of State plays the most influential role in terms of creating relationships with governments, brokering deals for peace and dealing with every nation's concerns. We are overlooking one key initiative to further assert our interests and core values around the world: global development. Helping underdeveloped nations develop their resources, provide them with economic tools and regional stability so that the potential for those countries to grow and become less dependent on the United States long term. Establishing a new cabinet post that will work hand-in-hand with the president and Secretary of State to advance our interests around the world. North Korea needs to be tamed and the peninsula needs to be denuclearized. Our allies and partners in the Pacific deserve our leadership. The Middle East is needs some work, but I believe our goal is support nation-states who want to thwart terrorists and militant groups who seek to cause havoc. For too long, we've been trying to find a solution to the Israel-Palestine conflict, it's time we bring all parties together along with our global allies to find a solution that works for everyone. I believe a two-state solution is the best route for both countries and for the region.